Place cornmeal, salt and boiling water in a bowl; stir well and let set for about 5 minutes to soften. Whisk eggs into the cornmeal mixture, one at a time. Stir in milk, then flour; whisk to combine. Add the melted butter and mix well. Fold in corn and jalapeños. Heat a large non-stick sauté pan over medium high heat. Spray with non-stick spray or lightly oil the pan. Drop the mixture by tablespoons to form small pancakes. Cook about 1-2 minutes and turn the pancake. Cook for about 1 more minute, until browned. Remove to a paper towel-lined baking sheet. 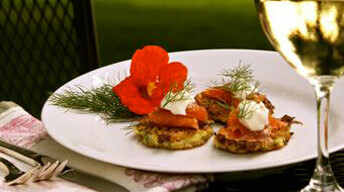 To serve: place corn cakes on a serving dish, top with a dollop of crème fraiche and a piece of smoked salmon. Garnish with chives. Place the crème fraiche in a small bowl. Add the lime zest, sugar and salt to taste. Chill until ready to use.